Damage to soybean plants and other crops has led to arguments and strain between neighbors. 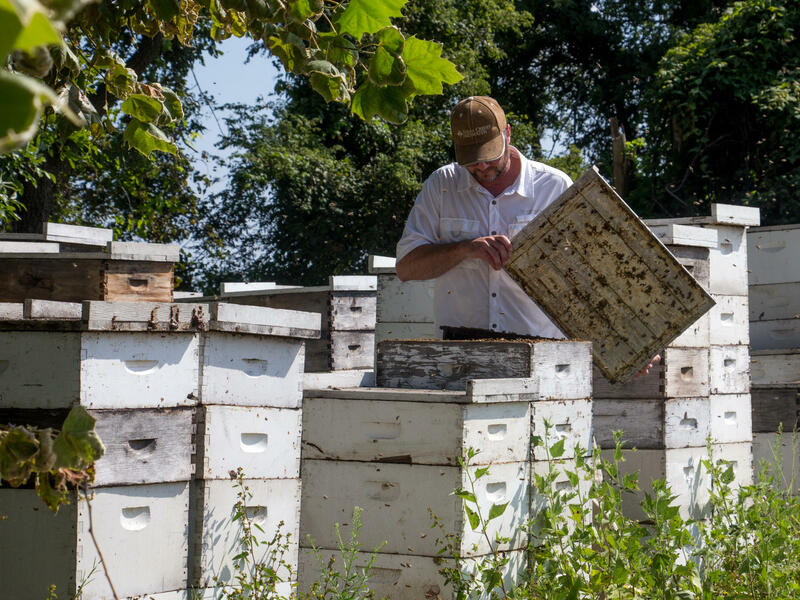 Richard Coy inspects one of his hives near Burdette, Ark. Honey production at this location fell by almost half this year — which he attributes to the drifting of weedkiller dicamba to nearby flowering plants. Pigweeds, which have become resistant to some well-known herbicides, infest a soybean field in northwestern Arkansas. 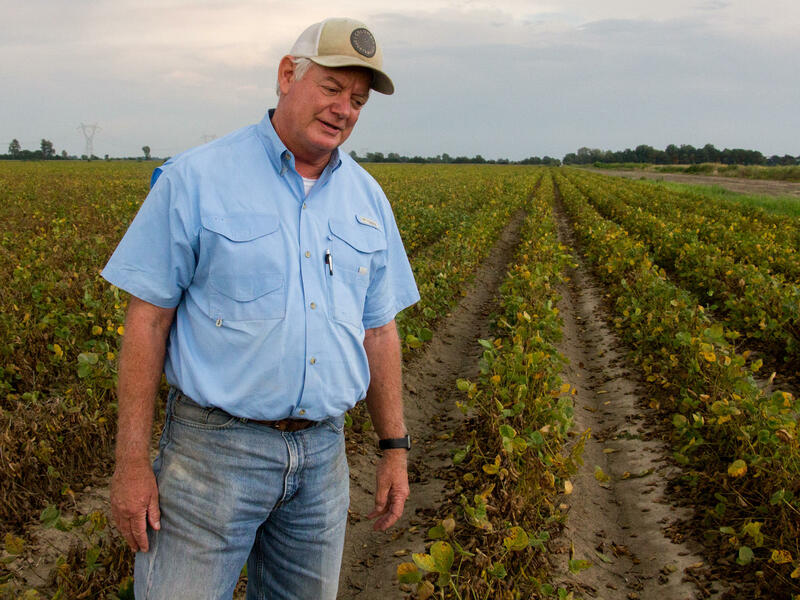 David Wildy, who farms near Manila, Ark., did not plant the new dicamba-tolerant soybeans. By midsummer, his plants were bent and stopped growing. These weeds have become resistant to Sullivan's favorite herbicides, including glyphosate, which goes by the trade name Roundup. Yet the rest of Sullivan's farm is beautiful. As farmers like to say, the fields are "clean." There is not a weed to be seen. In those fields, he planted soybeans that enjoy a novel superpower. They've been genetically modified by Monsanto, the biotech giant, so that they tolerate a different weed-killing chemical, called dicamba. As a result, starting this year, Sullivan got to spray dicamba on those soybeans. And he loves the results. "Now we finally got a chemical [where] we can farm clean and be proud of our crop. And don't have these vicious pigweeds coming up," he says. But there is a dark side of this weed-killing revolution, and David Wildy is living it. "It's a real disaster," Wildy says. His voice sounds tired. Wildy is well-known in Arkansas's farming community. He was named Southeast Farmer of the Year in 2016. This year, he planted the same soybeans that he has in previous years, not the new dicamba-tolerant ones. He didn't think he needed them. But in midsummer, all across his farm, a strange thing started happening. Soybean leaves bent into cupped shapes. Plants stopped growing. "My heart just came up in my throat, thinking, 'Oh my gosh, we've got a real problem,' " Wildy says. He was seeing the telltale symptoms of dicamba damage. Apparently, dicamba fumes had drifted into his farm from fields up to a mile away where neighbors had sprayed the chemical on their new dicamba-tolerant soybeans and cotton. Herbicide drift is a familiar problem for farmers. What happened this summer, though, was unprecedented in its scale. Dicamba damage was reported all over the Midwest and mid-South, from Mississippi to Minnesota. Farmers filed thousands of complaints. They reported damage to tomato fields, watermelons, fruit trees and many other crops. Farmers have used dicamba for many years. But this year, they used more of it, and they used it in a new way, spraying it over soybeans and cotton in the heat of summer, which can cause the chemical to vaporize from soil or leaves and drift away to damage other plants nearby. Soybeans are especially sensitive to dicamba. 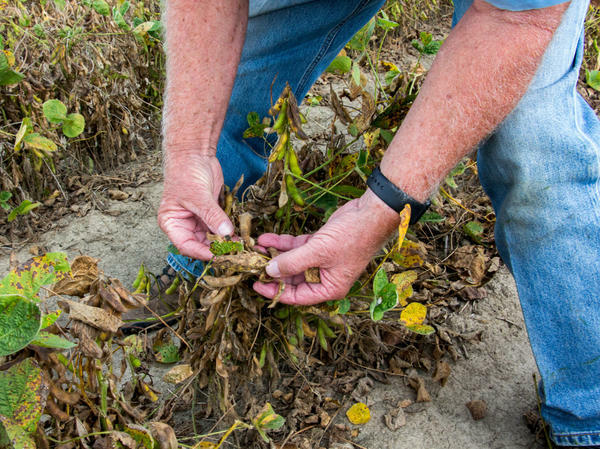 Wildy says that every single soybean field on his farm — thousands of acres — showed some injury. A third of those acres were hit hard enough to reduce his harvest. He says it probably will cost him several hundred thousand dollars. Just as upsetting is the loss of trust between neighbors, as farmers argue over who should pay for those damaged crops. One such argument led to a killing last year, and the horror of it still hangs over conversations about dicamba damage in northeast Arkansas. Mike Wallace, a farmer in Monette, Ark., had complained repeatedly about damage caused by a neighbor's dicamba use. At that time, the chemical was being used illegally. For reasons as yet unknown, Wallace arranged a meeting on an isolated back road with a man named Allan Curtis Jones, who worked on that farm. An argument broke out and Wallace was shot. Jones is awaiting trial for the killing. "It's something that is so heartbreaking to me. I see farmers taking sides, and enemies being made," Wildy says. "It's a situation that is so catastrophic and appalling, I never would have thought that I would see something like this." Sometimes, farmers can't tell where the wind-blown dicamba came from. In other cases, the source of the damage is clear, but farmers who sprayed it insist that they sprayed the chemical exactly as directed and refuse to accept responsibility for any damage. Tom Burnham, a farmer near Blytheville, Ark., whose fields were damaged, says that some of his neighbors were helpful and reported the damage to their insurance companies, just as they would do if they were in a car accident. "But there's some who were so nonchalant about the situation, so unforthcoming, I don't think those relationships will ever be repaired," he says. "As a human being, I can't trust someone like that." Farmers also are battling over whether they'll get to use this weedkiller next year. David Wildy has taken a stand against further dicamba use. "Regardless of how good it is, and how much I need it, if I can't keep it from damaging my neighbor, we can't use it," he says. Michael Sullivan, meanwhile, the farmer with the pigweed problem, thinks that farmers have no alternative. "The technology is too good to just trash it," he says. "Pigweeds are literally going to take the country over if we don't control them." Sullivan thinks the problem of damaged crops can be solved. The benefits of dicamba-tolerant crops will be so obvious, he says, that almost all the farmers in his area will decide to plant them — which means that there won't be any vulnerable crops that dicamba would damage. That might reduce the damage to crops, but the resulting free-fire zone for dicamba could be bad news for other vegetation, such as wildflowers and trees. The wider ecological impact of dicamba drift received little attention at first. Richard Coy, whose family-run company manages 13,000 beehives in Arkansas, Mississippi and Missouri, was one of the few people who noticed it. "If I were not a beekeeper, I would pay no attention to the vegetation in the ditches and the fence rows," he says. But his bees feed on that vegetation. Coy takes me to a group of hives parked between an overgrown ditch and a soybean field, in an area where farmers sprayed a lot of dicamba this summer. "Do you see this vine right here?" he asks. "The green one, [that] has little tags? Those tags should have been blooming during the month of July. As of today, they have not bloomed." No blossoms means less pollen for his bees. Coy thinks that dicamba drift is the most likely explanation. Other plants nearby, such as a cottonwood tree, showed clear symptoms of exposure to dicamba. Honey production at his site is down by 40 percent to 50 percent, Coy says. Across the region, in areas where farmers sprayed dicamba, honey production dropped by about one-third, on average. If farmers keep spraying dicamba, he says, he'll have to move his hives somewhere else. But the fate of his business isn't as important as the fate of the environment. Dicamba exposure "affects "things that people are not even aware of," he says. "It affects the butterflies, and all pollinators. But all of these insects are in the environment for a reason, and they all have to be sustained for everything to work as it should." Along the southern shore of Tennessee's Reelfoot Lake, a well-known state park, bald cypress and oak trees also showed symptoms of dicamba exposure this summer. Nathan Hoover, a forest health specialist with the Tennessee Department of Agriculture, called the damage "minor" and says he expects the trees to recover. The U.S. Environmental Protection Agency and many states are taking a close look at dicamba use. Regulators in Arkansas have voted to ban most spraying of dicamba in the state next summer, but the governor and leaders of the state Legislature still need to sign off on it. This summer in Arkansas, a weed-killing chemical called dicamba drifted across the landscape and damaged millions of acres of crops. And the injury went deeper. It split rural communities. It destroyed friends and took a toll on the natural environment. The extent of that damage remains unclear. NPR's Dan Charles has the story. There is one small field on Mike Sullivan's farm that he wishes people couldn't see. There are soybeans in there. But you might not even see them because this field's been overrun by monsters, ferocious-looking looking plants called pigweeds, as tall as a person and bursting with seeds that will continue the plague. MIKE SULLIVAN: I'm embarrassed to say that we farm that field. But we sprayed it numerous times, and it didn't kill it. CHARLES: Pigweeds have become resistant to the herbicide Sullivan's been using. The rest of Sullivan's farm, though, is beautiful, weed-free. Those fields he planted with a new line of soybeans with a special superpower. They've been genetically modified - by the biotech company Monsanto - so they can tolerate a different weed-killing chemical called dicamba. This summer, Sullivan got to spray dicamba on those soybeans for the first time. And he loves it. SULLIVAN: Now we've finally got a chemical, and we can actually farm clean and be proud of our crop and don't have these vicious pigweeds coming up. CHARLES: Drive half an hour to the west, though, and you can see a dark side of this weed-killing revolution. DAVID WILDY: It's a real disaster. CHARLES: This is David Wildy, Southeastern Farmer Of The Year in 2016. This year, he planted the same soybeans as usual, not the new dicamba-tolerant varieties. And all across his farm, strange things started happening. Soybean leaves distorted into cupped shapes. Plants stopped growing. WILDY: My heart just came up in my throat thinking - oh, my gosh, you know, we've got a real problem. CHARLES: That injury was caused by dicamba. And the best explanation seems to be dicamba fumes drifted in from fields up to a mile away, where his neighbors sprayed it on their crops. This happened all over the Midwest this year, from Mississippi to Minnesota. Farmers reported dicamba damage on tomato fields, watermelons, fruit trees. Dicamba has been used for decades actually, but farmers are using more of it now. And it's being sprayed in the heat of summer, when it's more likely to vaporize from the fields where it first landed and drift away. As Wildy drives past his damaged fields, he says this probably will cost him several hundred thousand dollars. But what upsets him even more is what it's done to the farming community. WILDY: It's something that is so heartbreaking to me that I see farmers taking sides and enemies being made. It's just a situation that is so catastrophic and appalling that I would've never thought I would have seen something like this. CHARLES: Farmers are battling over who will pay for damaged crops and also whether they'll get to use this weed-killer next year. David Wildy has taken a stand against it. WILDY: Regardless of how good it is, how much I need it - if I can't keep from damaging my neighbor, we can't use it. CHARLES: Mike Sullivan, though, the farmer who's fighting that pigweed problem - he says he has to use it. SULLIVAN: The technology is too good to just trash it because pigweeds are literally going to take the country over if we don't control them. RICHARD COY: If I weren't a beekeeper, I would not pay attention to the vegetation in the ditches and the fence rows. CHARLES: ...Because Coy's bees feed on that vegetation. He takes me to a group of hives parked between an overgrown ditch and a soybean field. Lots of farmers sprayed dicamba around here. COY: Do you see this vine right here? COY: It's green, and it has little tags. COY: Those tags should have been blooming during the month of July. As of today, they have not bloomed. CHARLES: Other plants also suffered. That meant less pollen for his bees. Coy's company has 13,000 hives across Arkansas, Mississippi and Missouri. In places where there was a lot of dicamba spraying this past summer, his honey production dropped by a third. If farmers keep spraying it, he says he'll have to move his hives somewhere else. And he says that's not even the most important thing. COY: It affects things that people are not even aware of. It affects the butterflies. But all of these insects are in this environment for a reason, and they all have to be able to be sustained for everything to work as the way it should. CHARLES: Many states and the Environmental Protection Agency are taking a closer look at dicamba use. Regulators in Arkansas have voted to ban most spraying of the chemical next summer. But the governor and leaders of the state legislature still need to sign off on it. (SOUNDBITE OF MAMMAL HANDS' "KANDAIKI") Transcript provided by NPR, Copyright NPR.